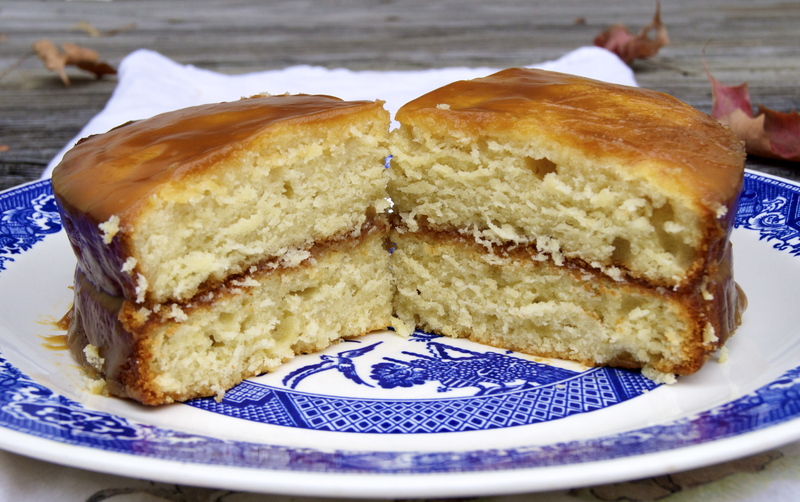 On a warm November day, I suddenly was struck by an undeniable urge to make a salted-caramel cake. 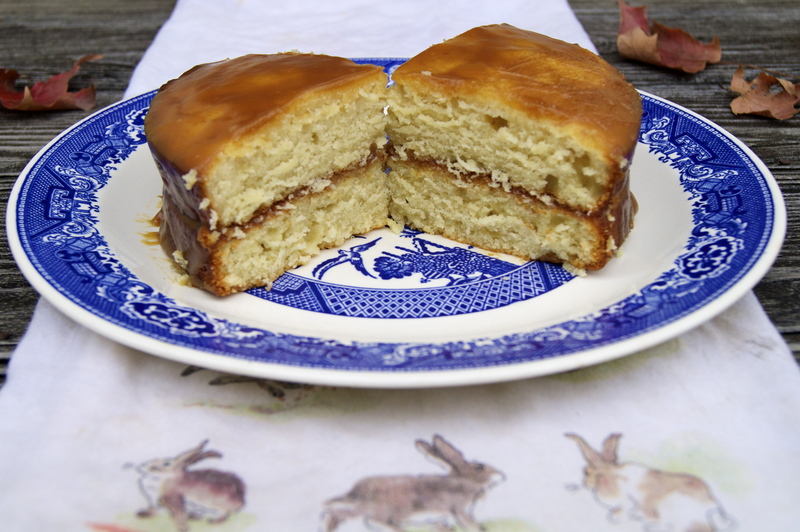 Not just any salted-caramel cake, mind you, but an over the top duckfat caramel cake. With rosemary salt. And local, grass-fed cream and yogurt…oof. 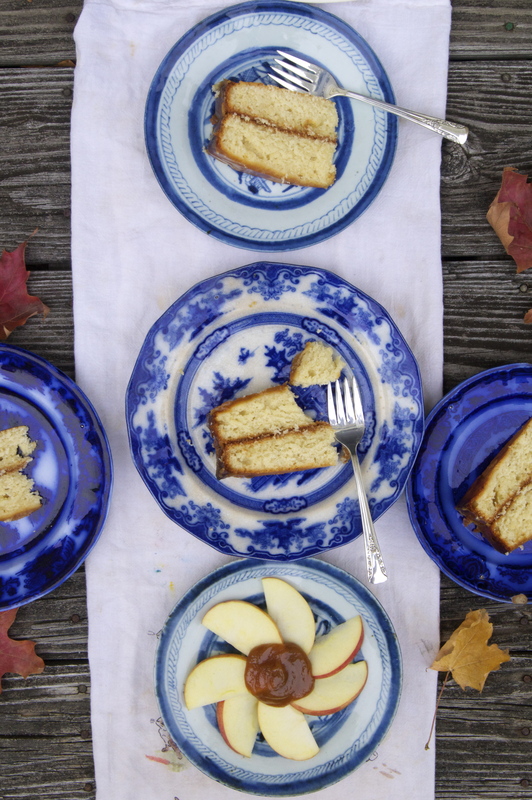 A simple, easy to make layer cake that is deceptively rich and light at the same time. 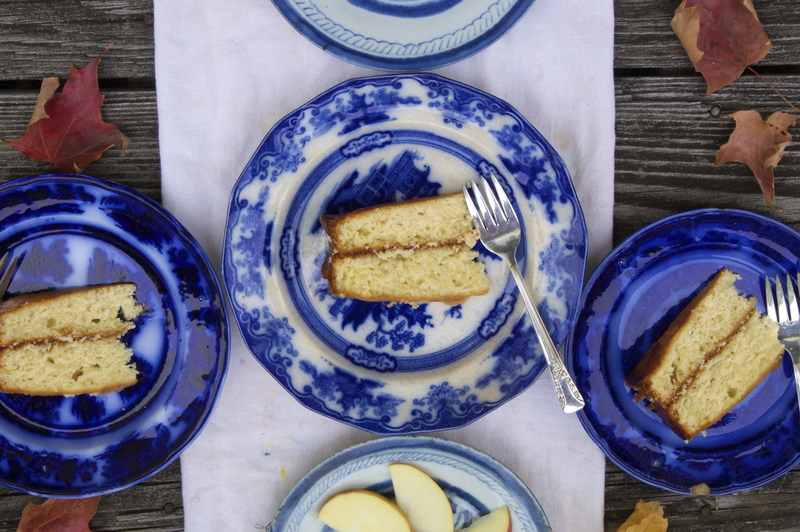 Incredibly moist and happily now a go-to cake that will match any frosting it meets. I found the recipe for the cake on Joanne Eats Well With Others, and adapted it a bit to add duckfat and a few other minor changes. Love it — jump to the end for the recipe! Joanne’s recipe is for a bundt cake, but I don’t have one of those pans, so instead used two 9-inch cake pans and it worked out perfectly. Because I was splitting the batter between two pans, my cake only took about 35 minutes to bake, rather than the 50 suggested for the bundt cake. Check it after about 25-30 minutes, depending on your oven. Mine is decades old and therefore sometimes it takes longer. It’s super delicious if you really let it get a little golden brown on the outside – having a nice crunch to the crust gives it an added caramel flavor. And let’s be honest, there’s enough fat etc in this cake to keep the inside moist while caramelizing the top! Preheat oven to 350. Grease your cake pans with a little bit of butter. Or keep the duck fat theme going and just go for it. In a large bowl, whisk together the flour, baking powder, baking soda and salt. Set aside. With a stand mixer or handheld beater, beat the fat until light and fluffy, about 3 minutes on medium speed. Add the sugar and beat until the mixture has paled a bit and is creamy. Add the eggs one at a time, incorporating well. Add the vanilla and mix well. Add in the yogurt in 1/4 cup increments, mixing well after each addition. Add the flour to the mix in three batches, mixing until just combined after each addition. Be careful to not over mix the batter, since it could affect the texture. Pour the batter into the cake pans and smooth with a rubber spatula. Bake the cake for 30-40 minutes, or until a toothpick inserted in the center comes out clean. Get it nice and golden brown…yum. Remove the cakes from the oven and allow it to cool in the pan for 5-10 minutes. Walk away! Resist! When it is cool enough to handle, gently transfer to a rack and cool for another hour before frosting. You can do it. There’s a few different ways of going about the caramel glaze. On Joanne’s site, she makes the caramel by melting the sugar without any liquid, and then adding in fat & cream after it turns golden. I learned making caramel differently, and felt making it this way resulted in more hardened sugar clumps than in other methods, but that’s just me! I think David Lebovitz’s recipe is easier and results in a smoother caramel, but really, caramel is caramel and is delicious no matter what. So, here’s his recipe, adapted to include my duckfat and rosemary obsession. It’s from his book The Perfect Scoop. I bought some rosemary-infused sea salt a while back, and it has a really distinct taste. You could take a couple teaspoons of finely chopped rosemary and add it in with the fat – cooking it into the caramel will infuse it best. Melt the fat in a large, deep, heavy saucepan. If using the rosemary, add it now, then add in the sugar, stirring often. Cook the sugar until it becomes a deep golden brown and just starts to smoke, but not burn. Remove from the heat and immediately pour in and whisk only half of the cream until smooth. Stand back, wear an oven mitt, apron, whatever – it will sputter! Once smooth, stir in the rest of the cream, then the vanilla and salt. If there are any lumps, whisk over low heat, and they should cook out. You can always pour through a fine mesh strainer if there are add stubborn clumps left behind, but they should all dissolve. I dangerously made a double batch, which lasts in the fridge for about two weeks. Do I regret it? Maybe. But I also have a big bowl of apples in the other room, and now feels like a good time for a caramel apple after probably a decade going without. Looks so good! Where can I get duck fat locally? Thanks Diane! I got mine at The Meat House!